The topper that you select for your wedding cake will be one of the focal points of your wedding reception. More and more brides are turning to the classic vintage wedding cake toppers to give their cakes that little extra something special. To help you find the perfect piece, this is what you should know about vintage wedding cake toppers. 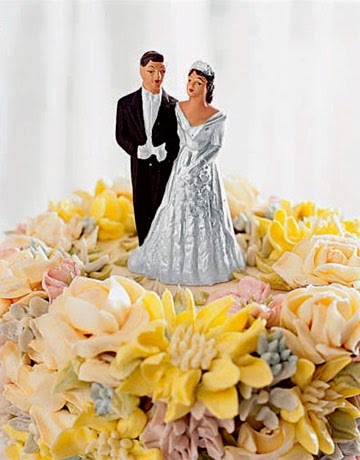 If you are lucky, you will have a vintage cake topper somewhere in your family. Using the same decoration on your wedding cake as your parents did on theirs would be a very sweet detail that would make your cake more meaningful. 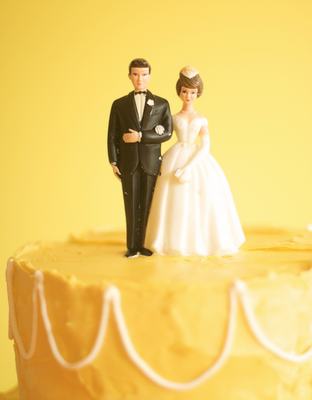 If your parents do not have their cake topper, be sure to ask around in the rest of your family. You might just find that your aunt has your grandmother's vintage topper tucked away in a box in her attic just waiting for you. For those who are not fortunate enough to have a cake topper in the family, there are plenty of places where you can find them. Truly the vintage ones are the most special and interesting, much more so than many of the ones currently being made. They will often be made of finer materials, have handpainted details, and may have unique whimsical touches that you just won't come across on a contemporary cake topper. Vintage wedding cake toppers abound on ebay, in vintage shops (both online and local), flea markets, and at some bridal shops. 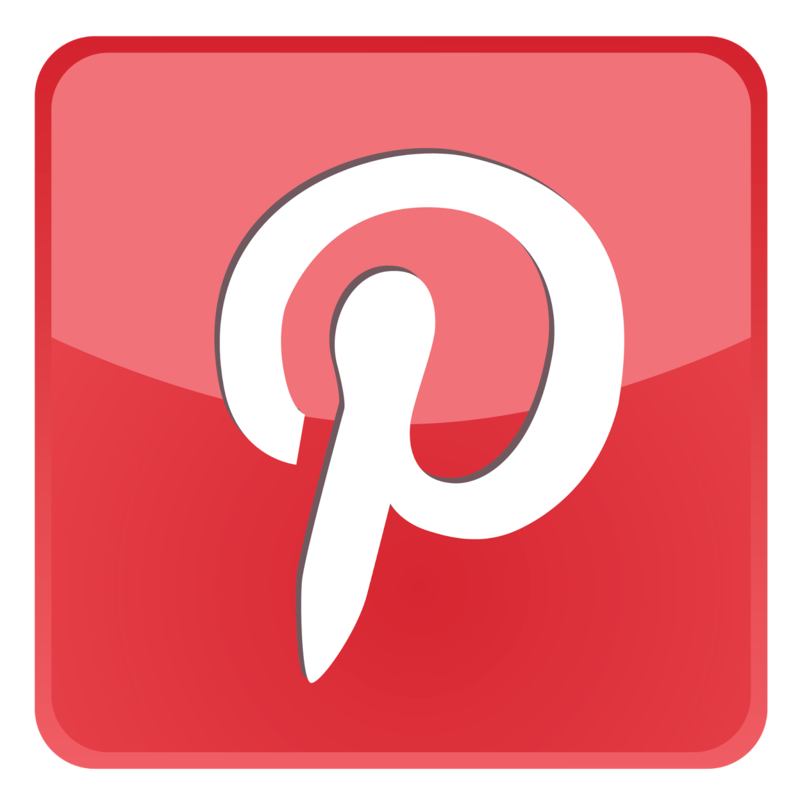 If ordering one online, read carefully to determine the size and condition of the piece. 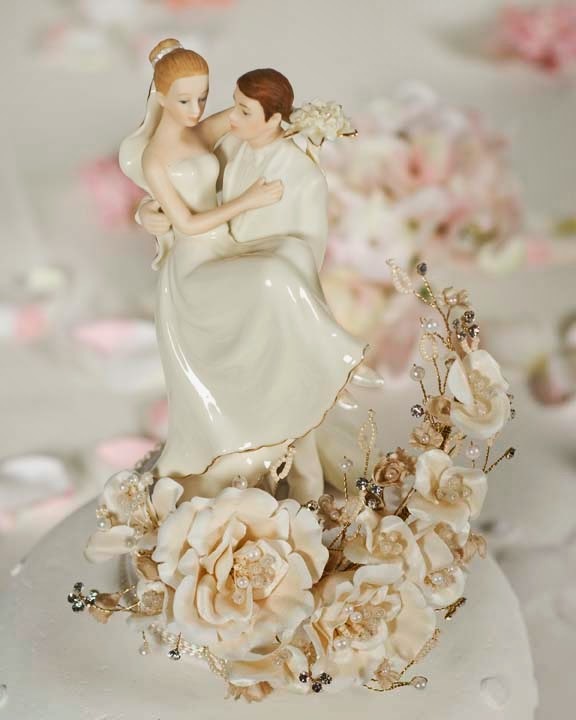 There are some very sweet cake toppers available. Lovebirds, doves, wedding bells, and of course the bride and groom are the most popular themes. Some of the pieces can be quite ornate and fanciful, especially the toppers with the chiming bells, which are often part of a large decorative arch. You may find special touches such as millinery quality silk flowers, glass pearls (perfect with pearl bridal jewelry sets), and even metallic accents. 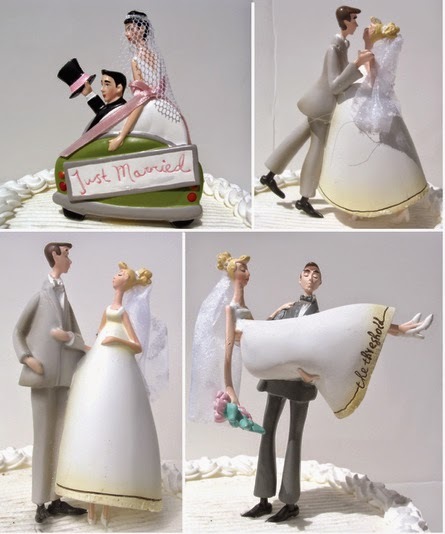 The bride and groom are far and away the most popular style of vintage wedding cake topper. It should be noted that before the 1950s, there were no bride and groom sets of color being produced (and they remained quite rare even after the '50s). 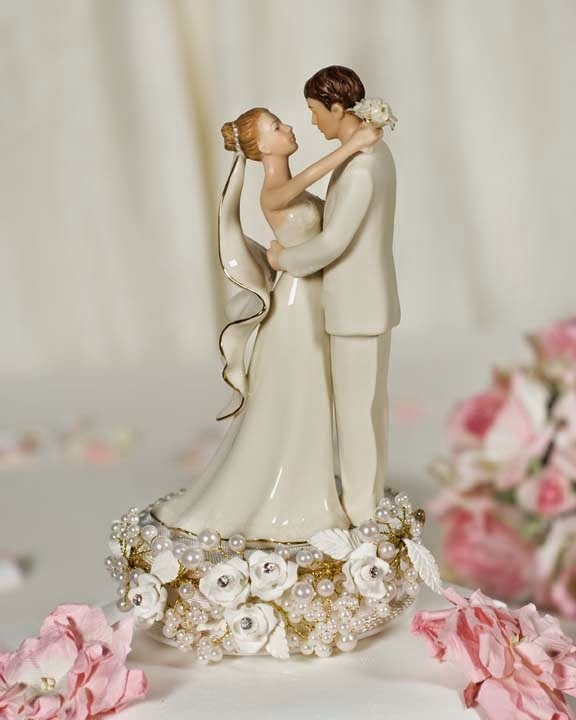 You will at times, however, run across very rare and highly collectible toppers which have been repainted to match the skin tone of the original bride and groom who used them at their wedding. A creative bride could also use this technique today to personalize a vintage cake topper that she likes.